Harrison Barnes came into the NBA with plenty of name recognition. Barnes has been a prominent fixture in the amateur basketball world since he was rated the number one high school prospect by several rating services. Despite high expectations, Barnes submitted an uneven NBA rookie season and lagged behind his hype. However, Harrison Barnes has taken his play to another level in the 2013 NBA playoffs and his rookie card values are starting to rise. 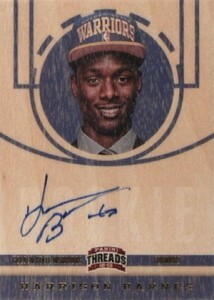 Shop for Harrison Barnes cards on eBay. With many college offers on the table, Harrison Barnes agreed to play for the University of North Carolina as a high-profile recruit in 2010. He did well during his time with the Tarheels, deciding to come back for his Sophomore season despite a strong certainty he would be a lottery pick as a Freshman. 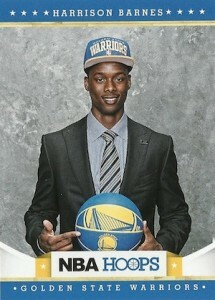 In 2012, Barnes was selected 7th overall by the Golden State Warriors, joining a lineup that featured other great young players, including Steph Curry and Klay Thompson. Although his play during the regular season was solid and he was named to the All-Rookie First Team, Barnes mixed flashes of brilliance with rookie struggles. After an injury to David Lee early in the 2013 playoffs, Harrison Barnes showed the abilities that made him a lottery pick. Once David Lee returns from his injury, it it will be interesting to see how Barnes is utilized. Regardless, it can be assumed that the Warriors will find a way to get him strong minutes each game. Because of his higher profile among rookies, Harrison Barnes cards are not cheap. His recognition is further boosted by his association with UNC basketball. However, Barnes' slow start kept prices reasonable and behind the top-tier rookies from the 2012-13 products. If he can continue to produce at a high level, Harrison Barnes can include his name among the top young players in the NBA. 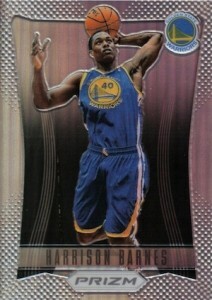 As a Panini exclusive, collectors can only find Harrison Barnes cards in Panini products. His rookie card lineup features a good mix of cards across all budgets and several premium autographed options. '17-18 Panini Noir Basketball "HARRISON BARNES GOLD 3 COLOR PATCH 10 10 MAVS"
Below you will find an example of what Harrison Barnes' authentic signature looks like. This can be used as a first point of reference for determining the legitimacy of autograph memorabilia, but is not a substitute for having your items authenticated by a well-respected professional autograph authentication company.